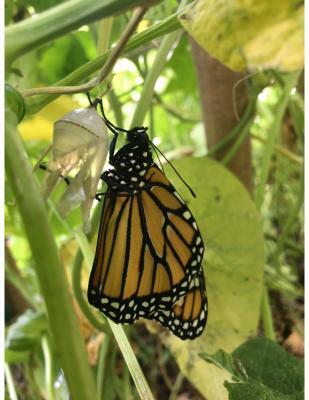 University of Illinois Extension Master Gardener volunteers are thrilled to report the emergence of the Monarch Butterfly from the chrysalis. 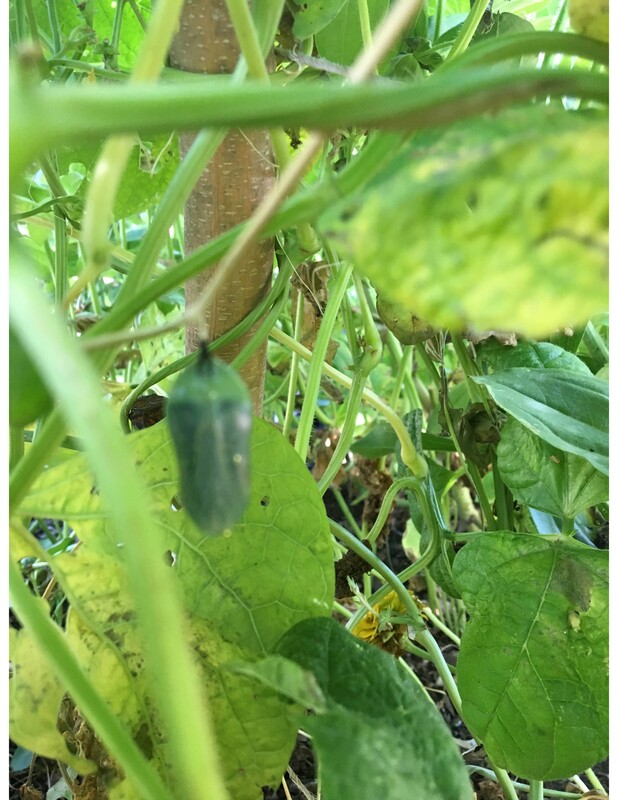 Volunteers have been observing the chrysalis inside the bean teepee within the Idea Garden on the Illinois State Fairgrounds! The chrysalis has been observed and photographed daily from July 29 to August 5, and we can hardly believe our good fortune to be there immediately after the Monarch emerged from the chrysalis and while it's wings were still drying! The chrysalis began to darken on day 7 of our observation and the shape of the wings became clearly visible. The Monarch emerged on day 8 of our observation. Pupal (chrysalis) stage is where the caterpillar transforms to an adult. This stage takes 10 to 14 days to complete. Monarchs are capable of flying 2,000 miles from Canada to Mexico and back again to the southern United States. Millions migrate every autumn, often stopping in the same rest spots each year. Some even fly as far as Hawaii and eastern Australia. In early spring and summer, returning females travel north in relays, new generations replacing old, laying their eggs along the way. The fully grown caterpillar changes to a barrel-shaped, leaf-green chrysalis studded with gold dots, then shows the colors of the developing butterfly inside. The change from egg to butterfly takes about 4 weeks. There are many generations a year.